No.5 will provide a holiday to remember. It is comfortable and homely whilst retaining its original character as an iconic NZ bach. 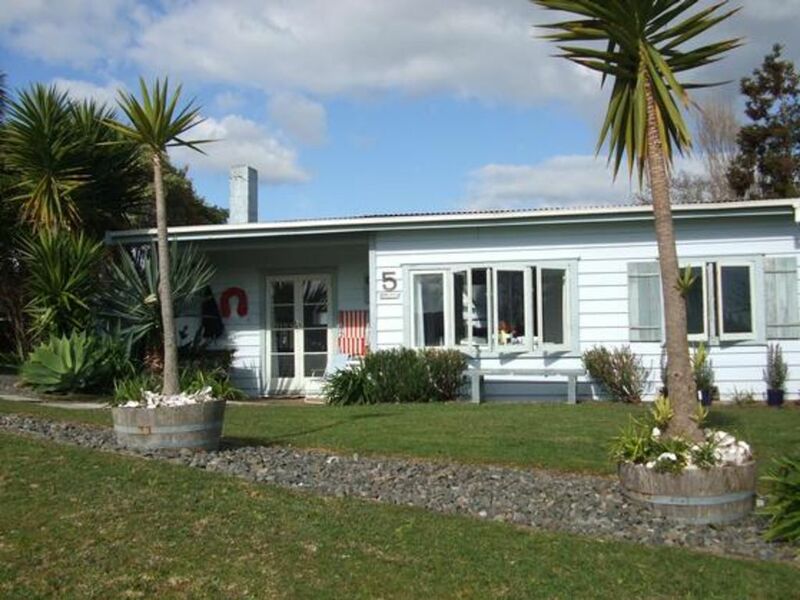 Its sunny position overlooking the harbour provides the perfect destination to come relax and enjoy Raglan. Within short walking distance you can enjoy safe swimming beaches and the local wharf. Cafes, restaurants, galleries and boutique shops are just a 10min walk away. 8km from world famous left hand point breaks.Whether it be a summer of sunshine enjoying BBQs outside on the lawn or tucked up warm and cosy in front of the open fire after sunset in winter this bach will let you get away from it all. Awesome location, lovely decor, and very clean. Perfect for a girls weekend! We enjoyed this beautiful Bach, full of character and charm!! We had a fun long weekend here. We had some issues making the booking though this website which was frustrating, however the owner spent time to help us . The cottage has lots of charm and is a 20 minute walk to shops and restaurants in town or 2 mins down to the wharf with a few places to eat there. Whilst the family bach has clearly lots of love it's useful to point out that the bathroom and kitchen are unmodernised. The old style window catches can be a bit fiddly, with a couple of panes cracked. However, the view from the front garden is dreamy and the dining table in the front window was lovely place to sit. No 5 The Bach is an authentic 1940’s cottage and reflects the Raglan ethos of sustainability and regeneration. The “old fashioned” window latches are an integral part of the bach’s charm and allow windows to be opened wide for a summer breeze and maximum airflow. Clean and tidy, owner very helpful. Thank you Rachael, it was a pleasure to have you.